Cook the peas and carrots the way you're accustomed to doing it. Sauté the drained mushrooms in several tablespoons of Butter Olive Oil. 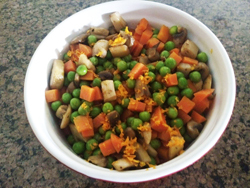 Add the mushrooms to the cooked peas and carrot mixture. Zest the orange or lemon rind and add to the vegetables. Personally, I prefer the orange flavor, but lemon zest works well, too, giving the dish a very fresh spring flavor. Mix all the ingredients together and serve immediately.